What is a hand-painted kitchen? A hand-painted kitchen is a type of kitchen finish where cabinets and door fronts are primed and then hand painted according to the home owner’s preferred style. Hand-painted kitchen styles include traditional, cottage, weathered or sleek and contemporary. Kitchens cabinets can be hand painted if they are made from bare, lacquered or waxed wood, MDF, foil wrapped laminate, melamine or acrylic. 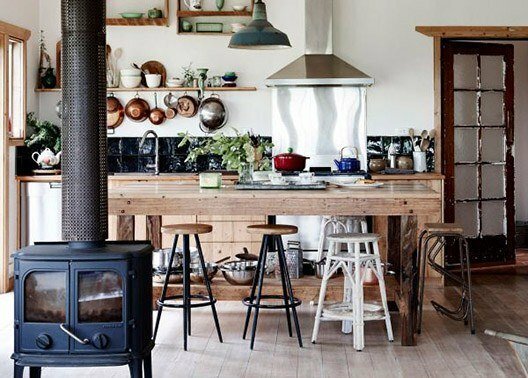 Awe-inspiring hand-painted kitchens flood Pinterest feeds around the globe, and it’s easy to see why. With paint nearly as old as humankind itself, we can customise just about anything within a tiny budget. Check out our hand-painted kitchens for more inspiration! Hand-painted kitchens are a great way to update your kitchen finish to get the look you want. Done by expert craftsmen, an updated kitchen can certainly increase the value of your home and give you a kitchen you love. The main differences between hand painted or sprayed kitchen are the time it takes and the finished look. 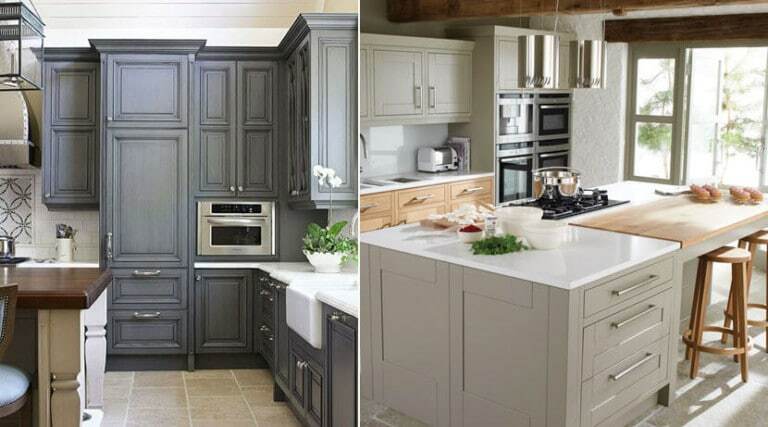 Here’s a quick guide to help you decide on spray or hand-painted kitchens cabinets. A spray painted kitchen refers to kitchen cabinets and doors that have been spray painted in a factory with a spray paint gun. Cabinets and door fronts are sprayed in even layers and create an even finish. A spray painted kitchen can be installed 3-4 days sooner than a hand-painted kitchen. Spray painting is a good option for a contemporary look. However, a spray painted kitchen finish can look flat in traditional or cottage style interiors. When a spray painted kitchen surface scratches or chips, it has to be resprayed in the factory or workshop. A hand-painted kitchen refers to kitchen doors and cabinets thatwere painted with a paintbrush or roller onsite or in a workshop. Brushes are used for smaller nooks and larger surfaces are painted with a paint-roller. The process takes longer than spray painting. However, the finish can be customised to suit any interior style. When the hand painted cabinets or door fronts are damaged, they can quickly be touched up with a bit of paint. Highly trained specialist painters use appropriate abrasives and primers to prepare the bare timber, MDF, clear lacquered oak, lacquered pine, waxed pine, foil wrapped laminate or melamine surfaces. Once primed, any painting technique can be used to apply in either eggshell, gloss or a satin matt finish using high-quality paint like Farrow and Ball, which will ensure the durability of your newly painted kitchen. Fitzgerald kitchens will build your painted kitchen in their factory and their team of highly experienced fitters will install then finally hand-paint it on site. Get a kitchen quote today. Here Mark Nash explains why a quality primer is necessary. 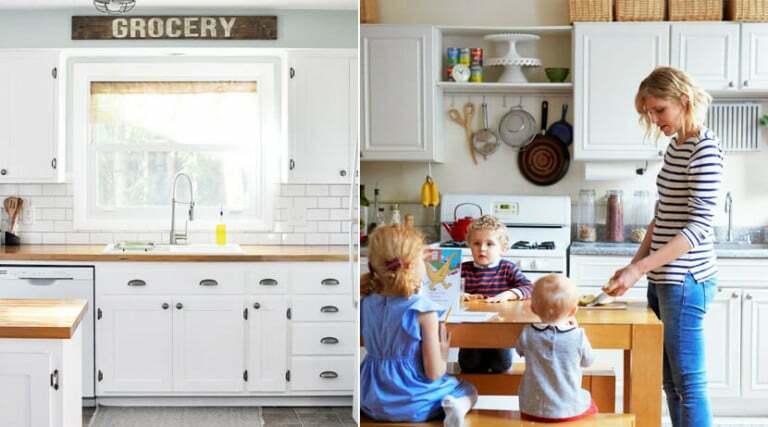 Budget-friendly – A hand-painted kitchen is an affordable alternative to replacing/remodelling. Paint can completely transform a kitchen at a fraction of a remodel’s cost and increase property value. Customisable – Paint is a versatile medium that can be manipulated to suit any style. You can have any hand-painted kitchen, from whitewashed solid wood to minimalist flat-front kitchens. Can work on most surfaces – The correct primer will ensure that the paint binds with the kitchen cabinets’ and doors’ surfaces. Easy to replace – You can easily refresh the look of your hand-painted kitchen with a different paint finish, colour or style. Don’t have to replace cabinets & door fronts – If your kitchen is in a good condition you can paint over the existing cabinets and door fronts. Quick maintenance –Scuff marks and scratches can quickly be patched up with paint at home. You can do it yourself – If you follow the correct paint procedure, you can create a professional looking hand-painted kitchen. Just remember that this DIY endeavour is very time-consuming. Won’t work on all cabinets – Broken or chipped kitchen cabinets need to be replaced as paint won’t hide the structural damage. Brushstroke marks – One of the most frequent hand-painted kitchen problems is paint marks. Inexperienced painters can easily leave visible paint brushstroke marks. That’s why it’s best to hire a professional to do the paintwork. Matte colours can look dirty – Because matte paint doesn’t clean as easily as semi-gloss paint dirt, and especially oil spills are visible. Time-consuming process –It can take a few days to give a kitchen a hand-painted makeover. How long the process takes depends on how intricate the specific paint finish and detail you require. Renovation can be disrupting – The kitchen is often the centre of the house, and the hand-painted kitchen process will make the area difficult to use for a few days. How durable are hand-painted kitchens? How durable hand-painted kitchens are, depends on the quality paint and primer as well as the quality of the paint job. Done by a professional kitchen painter, a hand-painted kitchen is very durable and can last for decades with only one or two touch-ups. Luckily, a hand-painted kitchen is a budget-friendly kitchen alternative which makes a future update more affordable to do. When done right, a hand-painted kitchen is easy to clean. Soapy water with a cloth is perfect for the job. However, if there are delicate areas avoid scrubbing because you may remove some of the paint detail. If you use a quality primer, one of the paints we suggest below and a good sealing agent you won’t have to worry about damaging your hand-painted kitchen cupboards. The cost of a hand paint kitchen ranges from €140-2600 The painting price depends on the size of the kitchen and whether you’re painting it yourself or hiring a professional. For the DIY route, you pay for your supplies only. The cost of paint supplies starts at €140 for a small kitchen and can go up to €570. The safer professional option ranges between €570-2600. Get a kitchen price estimate and see for yourself! Hand-painted kitchen doors and cabinets are only as good as its paint base. Remember to get a quality primer and paint from a trusted brand like Farrow and Ball for your hand-painted kitchen to enhance its durability. Here are our top paints to use for a beautiful hand-painted kitchen that lasts. Alkyd paint – Alkyd paint is a water-based paint that resembles oil paint. The thicker paint is more difficult to apply but lessens the appearance of brushstroke marks. It may take longer to cure and dry than normal water-based paints. But the result is durable, easy to clean and it doesn’t need a top coat. Aquanamel paint – This acrylic enamel has a smooth and glossy finish and is chip resistant. A high-end Pratt & Lambert aquanamel is easy to apply, dries quickly and requires fewer coats than other paint brands. Chalk paint can be applied on most surfaces, even without a primer. However, a chalk hand-painted kitchen will need an annual wax seal or one layer of poly sealer. The poly sealer will add a glossy look to the paint. Latex/Enamel paint – Enamel based paint is super durable but may take a long time to completely dry. The finish of enamel painted kitchen is smooth and hides the grain of the surface. Acrylic Milk Paint – Milk paint is a non-flammable paint that has a matte finish. This paint is an environmentally-friendly option but requires a top sealing coat to enhance its durability. Use paper sheets and tape to cover all the areas that you don’t want to paint. Remove cabinet doors and hardware then de-grease the kitchen cupboards and doors. Sand all surfaces that you are going to paint then use a cloth to remove the dust before priming. Lay the doors down when you’re ready to paint. Use a quick drying primer that doubles as a stain blocker, especially if you’re painting the kitchen white. Don’t use too much paint. Apply thin coats with even brushstrokes. With timber, paint in the direction of the grain. Let each coat dry completely before painting another layer and lightly sand in between coats. Use the appropriate clear sealer or wax as a top coat when necessary. Check out this video from Lowe’s Home Improvement on how to hand-paint a kitchen. Brand new kitchen cabinets that are either primed or unprimed can be finished with a hand-painted technique to fit your interior style. Paint techniques range from a more traditional country look up to a smooth and sleek contemporary kitchen. Hand-painted shaker and in-frame kitchens are very popular at the moment. The outer frame of a shaker kitchen adds depth to the cabinets. Plus, you can paint the outer casing in another shade or emphasise a design motif. The look of your hand-painted kitchen will also depend on the kitchen door style. A flat hand-painted kitchen door suits a contemporary or modern interior while grooved or panelled doors are ideal for a cottage style kitchen. Colour in the kitchen is a wonderful thing. Since the kitchen is the social hub of the home colour can turn a bland area space into a space you want to linger in. 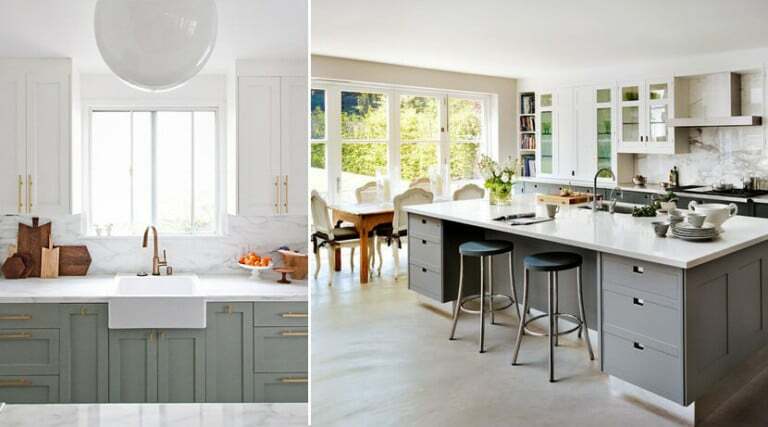 In the latest trends, homes come alive with colour, and these popular hand-painted kitchen colours stand out above the rest. A classic white hand-painted kitchen is versatile as it can fit into any interior style. Whitewashed kitchens is ideal for an industrial or Scandinavian interior while a semi-gloss finish is more suited to contemporary homes. Soft blues are great for a neutral home that needs a subtle visual lift. Plus, a blue hand-painted kitchen can have a calming effect on people too. This year we’re delving into dark greens. Emerald, ivy and colours inspired by the forest create attention-grabbing hand-painted kitchens. This deeper colour is perfect for homes with personality. A Neutral grey is a safe option that is sure to give any home a lovely update. Darker shades of grey, especially dove grey and charcoal, can add a designer-edge to a home. Consider an awesome backsplash. Whether you choose a matte, gloss or weathered look, there is a tile backsplash to enhance your hand-painted kitchen even more. But don’t stop at a hand-painted kitchen with backsplash tiles! You can’t paint everything in different colours, that includes a hand-painted kitchen island. Spice up any kitchen with a colourful kitchen island and a cheerful hand-painted kitchen backsplash. BTW, if you need help picking a kitchen countertop, download our eBook on how to choose the best countertop for your kitchen. You get a kitchen finish that is unique to you and will surely have the neighbours green with envy. In this mass-produced world that we live in, it is so refreshing to be able to have a kitchen where every brush stroke was done by hand. The process celebrates tradition and craftsmanship. 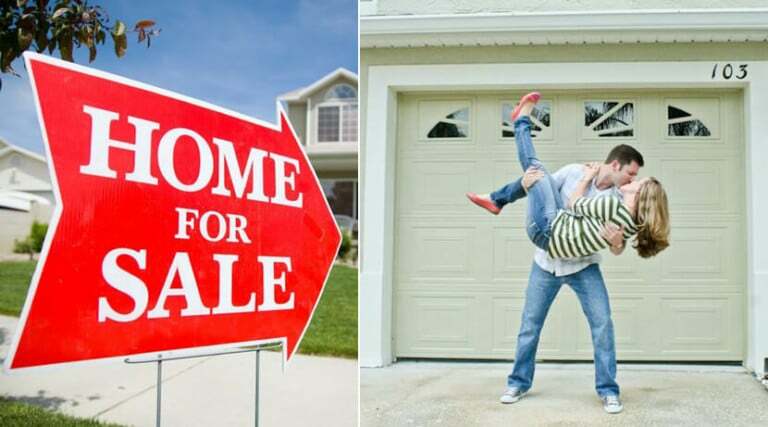 Kitchens are a big selling point when it comes to putting your home on the market. A hand-painted kitchen adds a unique and authentic touch to your home that might just clinch the deal. Professional hand painters use the correct finishes to eliminate problems of water penetration and the yellowing or fading of paint. The finishes are also very easy to maintain and the quality guaranteed. Because the kitchen cabinets are primed in a factory, it allows for a dust free environment that ensures a smooth finish to your kitchen cabinets. The painting process allows wood grain and texture to come to life straightaway, unlike factory spray painted kitchen cabinet surfaces which creates a completely smooth finish. Adding texture to a kitchen adds a warm and inviting feel to the room. In short: hand painting adds depth and character that factory spray-painted finishes cannot achieve. Another great attribute of a hand-painted kitchen is that you don’t have to replace an entire cabinet door if it gets a knock or scratch. You can simply have that area repainted whenever, with minimal cost and effort. We’d love to help you create your hand-painted kitchen. So, contact us or visit our showroom to chat with us about your perfect kitchen!